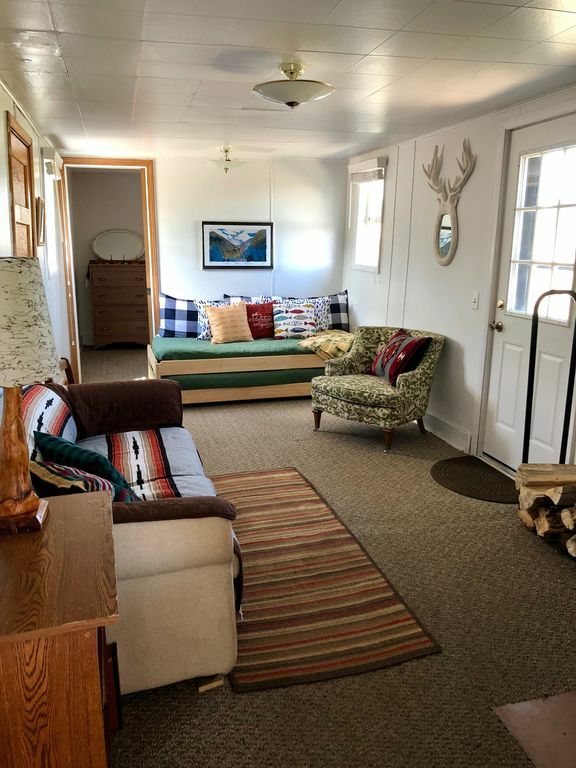 The location is ideal for getting off the grid and enjoying private trails on the tranquil side of the Continental Divide. Our Elk Run Trail is snowmobile packed for non-motorized recreation and is a great hiking trail in the summer. Steamboat is about an hour away. The "Nest" is on top of a moraine at 9000 feet in elevation. Routt National Forest and the Zirkel Wilderness is a short distant away. The cabin has spectacular views and seclusion. If you are looking for a tranquil place to un-plug this is it. The area is abundant with wildlife, moose, elk, deer, pronghorn, eagles, hawks, owls, fox, marmot, squirrel and bear to name a few. Recreational opportunities abound from hiking, fishing, off road, wildlife viewing, skiing, snowshoeing, snowmobiling and of course watching the stars in an unpolluted night sky. From the alpine flowers of spring and summer, the colors of fall in the aspens and the snowy wonderland of winter this is the ideal home base. The bathroom listed is a compost potty house a short walk from the cabin. The kitchen is fully equipped, the sink plumbed for grey water disposal and we supply your potable water. We also supply your firewood both for your wood burning stove inside. We supply the linens and towels. The shower house is a short distance from the cabin. Our directions here are best to use as other methods aren't reliable. The road is closed and the access up to the cabin is 150 yards on a groomed trail. Snowshoes are helpful. The outhouse is cleaned between each visit. The shower house is a short distance from the cabin. Spectacular views of the Medicine Bow Range to the east, Park Range to the west, Never Summers to the south and Pitch Pine and the Butte to the north. Some items such as salt, pepper, oil, foil, paper plates and plastic utensils. Deb is available to speak about North Park Wildlife Rehabilitation. Hummingbird Feeders will delight! The cabin was cozy with wonderful views all around. Patrick helped us snowmobile our gear up to the place and back. We'll definitely return to this special retreat. A lovely spot to get away for a few days. Amazing views! Deb was a wonderful host. Cabin was clean and cozy with spectacular mountain views. Deb and Pat were very kind and helpful and made sure we had everthing we needed. Deb gave us suggestions of things to do and where to explore. Pat helped me get our stuff up to the cabin with his snowmobile since the last bit of road is closed. My daughter and I had a great time playing in the snow and hanging out together. We found lots of animal tracks in the snow and heard some, but we only caught a glimpse of an antler. Maybe next time we can explore more to see the wildlife. I would definitely recommend coming here and hope to come back in the spring. Above and beyond what we expected! Deb is incredible!!! My sister and I went up to this cabin completely unprepared for a snow storm. My car got stuck right before we hit HQ, Deb & co helped to get my car to a safe place and we ended up staying at the Whistle Pig due to it’s closeness. Even if we didn’t stay at the Eagle’s Nest due to the snow storm, Deb went out of her way to help us up to the Whistle Pig and ensured that if we couldn’t get home safely the next day that we could stay until it was safe to get home. Although I can’t speak for this particular cabin, I can speak for the host and she went above and beyond to ensure that we were safe and warm and had a great night. Thank you Deb, we’ll definitely be back and will stay for much longer! We stay 2 boys 3 dogs wife 2horses for our elk hunt two years hav lots of fun and we did get a cow elk. Deb is excellant !!! This was an amazing place to see the fall colors. The aspen were all lit up in shades of red, orange, and yellow. A fox came around the cabin three different times, and we saw deer and two moose. Deb was very helpful and gracious. Highly recommend! Routt National Forest and the Zirkel Wilderness are just up the road. The Delaney Butte Lakes and Roaring Fork and Platte Rivers are close by. Buffalo Pass, for superb snowmobiling is a short distant away. Please check your weather conditions before heading out as mountain conditions can change quickly. The Jackson County Road dept. does not plow on weekends and holidays.